Robert Kevin Appier was born December 6, 1967 in Lancaster, California located in the Northern Los Angeles County. The six foot two, right hander, was nicknamed “Ape”, getting signed out of Antelope Valley Junior college as the Kansas City Royals first round pick in 1987 (the 9th pick overall). He won 12 games at the A & AA levels combined in 1988 & was promoted to AAA. He would debut in June 1989 going 1-4 that month before being sent back to AAA. In his 1990 Rookie season in Kansas City, he went 12-8 with 127 strike outs in 185 innings pitched posting a 2.76 ERA making the Topps All Star Rookie, coming in third in the Rookie of the Year honors. In 1991 he pitched over 200 innings for the first of three straight seasons, something he would do in six of the next seven seasons as well. He won 15 games in 1992 posting the AL’s second best ERA at 2.46 ERA while striking out 150 batters. He peaked the next year, leading the league in ERA (2.56) winning a career high 18 games (going 18-8) fourth most wins in the AL. He came in third in the Cy Young voting, pitching 238 innings with 186 strike outs, including a 33 scoreless inning streak. He won six straight games twice during the season, and in a hard luck performance lost a 1-0 one hitter to Kenny Rogers & the Texas Rangers on July 27th. In July he won the Player of the Month Award. 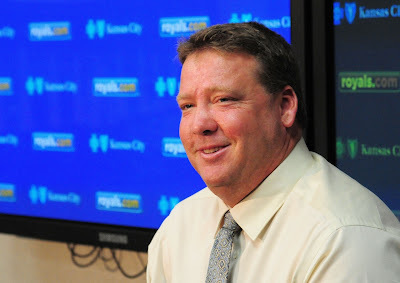 After a 7-6 record during the baseball shortened 1994 season, Appier returned to another 15 win season in 1995 (8th most wins in the AL) as the Royals finished in second place. That year he was the June AL Pitcher of the Month. 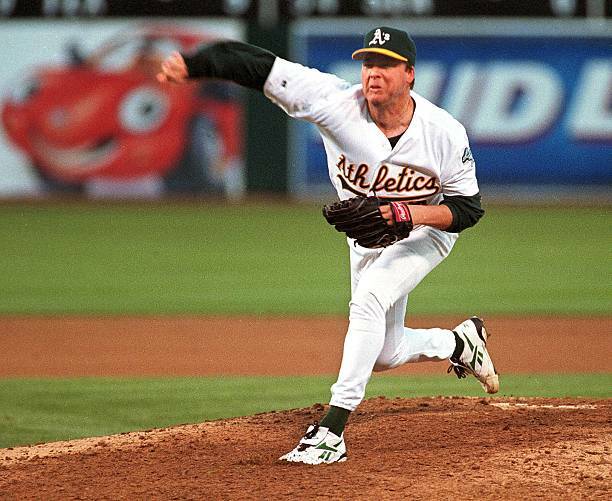 In 1996 he was 14-11 striking out a career high 207 batters (third in the AL) pitching 211 innings with a 3.62 ERA. In the 1997 off season, after a fifth place 94 loss season, the Royals promised him they would build a winning team, so he signed a long term deal with them. In the off season he got hurt, needed surgery & missed the entire 1998 season except for three September games. He was 9-9 with the Royals in 1999 but demanded a trade when he didn't see the team trying to improve since his signing. He would spend ten seasons with the Royals winning over 14 games or more, four times, not getting much attention playing for a small market team. 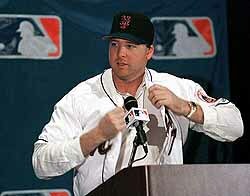 In July 1999 he was traded to the Oakland Athletics for Jeff D'Amico, Brad Rigby & Blake Stein. He went 7-5 for the second place A's the rest of the way. In 2000 he proved to be a solid veteran on a staff of young star stud pitchers that included the future "big three"; Mark Mulder, Barry Zito & Tim Hudson. Appier went 15-11 (tied for second on the staff with Gil Heredia) posting 127 strike outs & a 4.52 ERA. He threw alot of pitches & had control issues, leading the AL in walks (102). Post Season: Oakland won the AL Western Division that year. Appier pitched in two games of the ALDS, including one relief appearance. In Game #2 he allowed three runs on six hits, taking the loss to the AL New York club. 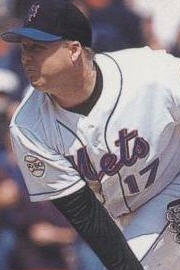 He became a high priced free agent in the offseason and was signed by the New York Mets for 2001 to replace the departed Mike Hampton. His herky jerky motion and beer belly made him look rather odd pitching on the mound. The expectations were certainly for him high as he came to New York, but he never did achieve what he was expected to do. What made it worse was that the Mets were coming off two straight post season appearances & by 2001 the team was slowly taking a turn for the worse. Appier started out the season, pitching in the second game of the season at Turner Field in Atlanta. He allowed two runs in six innings earning no decision. The Braves won the game on a Keith Lockhart fielder's choice RBI. Appier won his second start, which was also against the rival Atlanta Braves, this time at Shea Stadium. He then lost five of his next six decisions. In the first two months of the season he allowed three runs or more in seven of eleven starts. In four of those starts he allowed four or more runs. In June he started out the month pitching seven shutout innings against the Marlins in Florida. The Marlins A.J. Burnett was just as good, pitching a shutout into the ninth inning. The Marlins won it on an RBI single off John Franco in the bottom of the 9th. In his next outing, he pitched another seven shutout innings, this time getting a win in Tampa. From there he had another bad stretch, losing three straight. 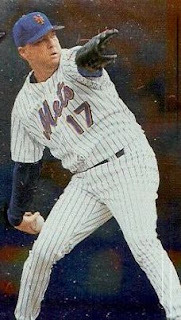 On July 7th he got a no decision in a Subway Series game, although he pitched eight shutout innings, in the Mets 3-0 win. The Mets scored three times in the 10th inning off Mariano Rivera. Appier then went on a roll, not losing any games from July 24th through the end of the season. In that stretch he won six games & earned five no decisions. After two bad outings to begin August (both no decisions) he allowed just one run on one hit through seven innings, to the Colorado Rockies on August 22nd. 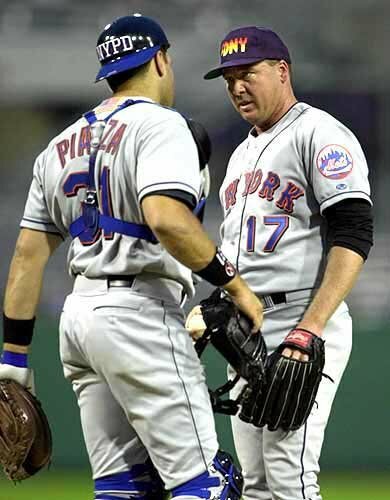 After the September 11th attacks, he pitched the second game when play resumed, beating the Pirates 7-5 in Pittsburgh. Appier went 4-0 posting a 1.87 ERA in the month of September, as the Mets made a run for another playoff berth but fell out of the race in the final weeks. They finished third at 82-80. 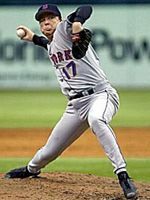 Appier did tie Al Leiter & Steve Trachsel for the lead the team in victories with 11. He led the club in strikeouts (172) starts (33) and innings (206) posting a 3.57 ERA. 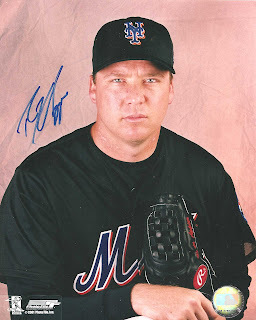 It was a short Mets career for him, as he was traded to the Anaheim Angels that winter for Mo Vaughn. Post Season: With the Angels he was 14-12 with a 2.92 ERA in their 2002 Championship season, making five post season appearances. In the 2002 post season he got a no decision in the ALDS & started Game #1 of the ALCS against the Minnesota Twins. He pitched five innings allowing two runs taking the loss. In the final deciding Game #5 he earned no decision in the 13-5 Angels win over Johan Santana & the Twins. In the World Series he got the start in Game #2 but was removed after two innings, allowing five runs to the San Francisco Giants. He got another start in Game #6 but allowed three more runs & was gone in the 5th inning. Overall in the Fall Classic he allowed eight runs on nine hits, over six innings pitched earning no decisions. 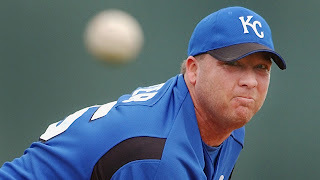 Appier was traded back to the Kansas City Royals in 2003 where he ended his career. Although he signed a minor league deal in 2005, he never made it back to the majors. He ended his 16 year career at age 35 due to arm tendon injuries in 2004. Appier was 169-137 lifetime, posting 1994 strikeouts (84th all time) with 933 walks in 2595 innings over 414 games, 402 starts (134th all time). He had 34 complete games with 12 shut outs and a 3.74 ERA. He allowed 232 HRs with 933 walks (144th all time) & 106 wild pitches (92nd all time). 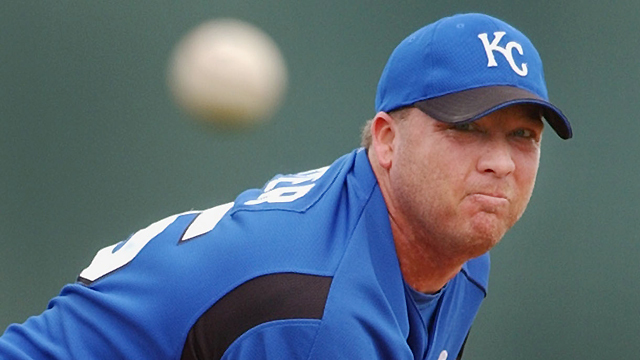 Honors: Appier was elect to the Royals Hall of Fame in 2011. In 287 games as a Royal he was 115-92 with a 3.49 ERA.